The wonderful fruity flavors of hibiscus and raspberries in a delicious dessert. Share it with the whole family! 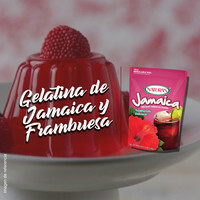 In a medium bowl, add 1 cup hot hibiscus drink to one jello package. Mix for 2 minuets until dissolved. In a different mixing bowl, add 2 cup hot water to the second raspberry jello package. Mix for 2 minutes until dissolved.